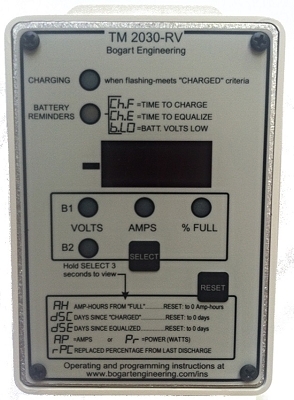 The TriMetric TM-2030 is our new battery monitor. It is a standalone monitor, but it can also work in tandem with our new SC-2030 charge controller for optimized battery life, capacity use and efficiency. TriMetric TM-2030 is available in two models:TM-2030-RV and TM-2030-A. Our older models (TM-2025 and TM-2020) are still supported. The TriMetric is used to monitor battery systems used in remote homes, RVs or boats that have batteries that store solar, wind, or possibly generator powered chargers. They will help you maintain your batteries. “Percent Full” (“State of charge”) of your batteries, so you can see if you need to charge them more, or check that overall usage is less than your charging resources. The TM2030 is easier for you to program the necessary system parameters. The TM-2030 will operate with (nominal) battery systems from 12 to 48V. The TM-2020 will operate with 12 or 24 V systems, but requires the addition of the “TM-48VA” Adapter and lightning protection board when using it with 48V battery systems. This also provides lightning protection for the TM-2020. The TM-2030 has a “simplified” level of operation suitable for most users, but can be configured for more flexibility (and complexity) where occasionally required. (For the technically knowledgeable only) The TM-2030 has a serial data output of all the “real time” data—which could be used to access data for other control or output in, for example OEM applications. It is easier to view and enter programmed parameters.. It is about typically about $15 more than the TM-2020. For 48V systems it is less expensive than the TM-2020 because it does not require an extra 48 volt adapter.